10 a.m.: Clark County Commissioner Chris Giunchigliani on decriminalizing feral cats. 10:30 a.m.: Mary Olund of Cabernet Standard Poodles on why the "royal poodle" is a marketing myth. 11 a.m.: Hal Newsom of WallyPets.Com talks about selling wallabies. 11:30 a.m.: Steve's sister talks about volunteer dog-walking for the Humane Society of Sedona and listener/podcaster Bay Loftis returns to talk about her newly adopted puppy, Doris! So far as I can tell, that's George Burns, Michael Jackson, Lucille Ball, Stevie Wonder, Garth Brooks, Kermit the Frog and ... I dunno about the guy in the plaid shirt. Jeff Foxworthy? 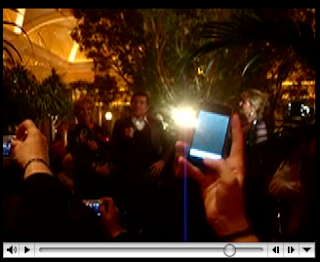 Steve Wynn has spoken eloquently about attracting a young, hip crowd to Encore. He has repeated his aim at a St. Tropez-like place where the party goes on seamlessly from mid-afternoon to early in the morning. But how does an impressionist doing 20-year-old punchlines appeal to that audience? 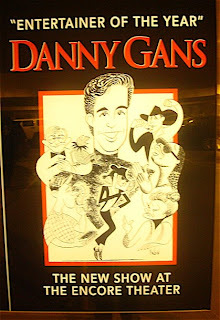 Who in the demographic Wynn is courting will understands the emotional punch of Gans' George Burns? And Lucille Ball? Really? Merry Xmas and Happy Hannukah everyone! Hear the show by clicking on the date or right-click to download it and listen whenever you want. Or subscribe via iTunes here or via Zune here. This is Steve Wynn’s week, no doubt about it. On what is traditionally one of the slowest nights in Las Vegas and in the middle of the worst recession in generations, he opened the doors to his $2.3 billion expansion, Encore. 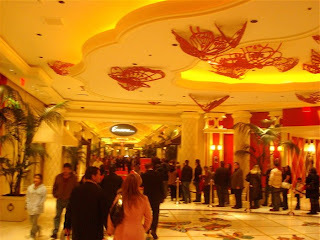 The results were a flood of curious explorers that led to bumper to bumper traffic on the Strip as far south as the Mandalay Bay and a line all the way into the Wynn casino. 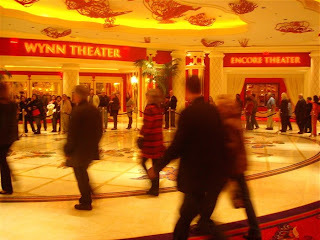 In honor of that milestone, over the next two weeks we’re presenting our interview earlier this month with Wynn in which he talks about everything from the shape of the buildings to the original plans for the Encore TV commercial. In Banter: Encore, snow, Criss Angel, City Center, Elton John. Many others documented the opening far better than me, and I urge you to head over to EncoreOpening.Com to see all the terrific commentary and photos provided by Hunter at RateVegas.Com and Chuck Monster at VegasTripping.Com. Also, Dave McKee had some insightful thoughts on the design of the property that you can find here. But here's a 6-minute video episode of The Strip showing the Wynns as they declare Encore open for business. The people who were already inside were either invited friends or hotel guests. Click on the image to watch, and sorry as always for the shaky camera work. It may be better to merely listen. I went on to dinner with Hunter, his wife Megan, Chuck, Mike E and listener/reader Brian Fey as well as a couple of new friends at Sinatra, where the Wynns dined nearby with Andre Agassi and Steffi Graf among others. It was an outstandingly delicious meal. 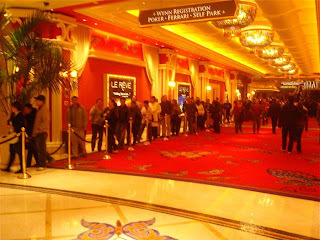 ...and on, into the Wynn casino. There were at least 800 people in that line. And there were others at other entrances. Wow. We're back in the studio finally tonight at 6:45 pm PT for a new episode of The Strip, playing some of my lengthy sit-down interview with Steve Wynn a week prior to our walk-through. Join us at LVRocks.Com from 6:45 pm-8 pm tonight to hear it and chat with fellow listeners or wait a day and grab the podcast. 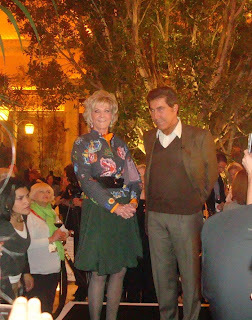 Wynn goes into detail about his life and times with Frank Sinatra, for whom there is an eponymous restaurant, how Siegfried & Roy impacted occupancy at the Mirage, what the MGM Mirage did wrong in designing MGM Macau and what the original Encore TV commercial was supposed to look like. Plus, news from Vegas, a new poll, the trivia question, listener feedback and, as always, the Top Secret Tourist Tip of the Week. I spend a lot of time on this blog criticizing other journalists for work that is problematic in various ways. I also praise excellent work, but who remembers anything but the slings and arrows? I believe it to be healthy to keep journalists' feet to the fire and I view myself, given my own experience and expertise, to be qualified to offer such commentaries. I never claimed to be perfect myself, and today I'm going to prove that I know that. I will not have a profile of Steve Wynn running in USA Today on Monday. It kills me, I feel horribly and I hope I don't ever forget how miserable I feel right now. Those wishing to indulge in shaudenfraude are welcome to do so. A couple of hours ago, USA Today had to pull my story. I had rewritten a version of their piece for the Agence France-Presse wire, a French news service. There was a miscommunication and the AFP wasn't supposed to run my piece until midweek or later. But the piece instead went out on Saturday, some international news websites posted it on their sites and USA Today decided they couldn't run a similar story from the same writer. It wasn't supposed to work out this way. I should have known better, that something like this could possibly happen. Freelancers are notoriously promiscuous, but this arrangement was subject to too many potential problems -- all of which actually came to pass, natch -- and I blame only myself. I was neither dishonest nor unethical, but in the end I might have considered avoiding even the potential for this sort of trouble. I'm terribly sorry and saddened. The AFP piece is here and it's good, although not nearly as good or as long as what USA Today was planning to run. Oddly, it will probably be better read, seeing how AFP wire is avidly employed in most of Latin America, Europe and Asia. But mostly, I am punishing myself the only way I know how, by publicly announcing my stupidity and carelessness. And then I'm getting back to work.